“Diplomatic battles surrounding Guaido’s recognition have extended to the International Monetary Fund (IMF). According to Bloomberg, the IMF cut off Caracas’ access to almost US $400 million in special drawing rights (SDR). While the IMF has shown no signs of recognizing Guaido, and lists Finance Minister Simon Zerpa as Venezuela’s representative, sources told Bloomberg that a government must be recognized by a majority of the Fund’s members to access its SDR reserves. All those nations/governments sitting around the table at yesterday’s meeting… and YET… most still RECITING THE SAME SCRIPTED “SONG” and not much is said about the fact that Venezuela is experiencing a crisis due to AN ECONOMIC WAR HEADED BY THE USA AND ALLIES AND SUPPORTERS/PEDDLERS OF THE SAME…. and that my beloved ones is a FACT! A fact that the worldwide population must also acknowledge that it is a WAR AGAINST THE POPULATION OF VENEZUELA! Sanctions, looting, and BULLING. 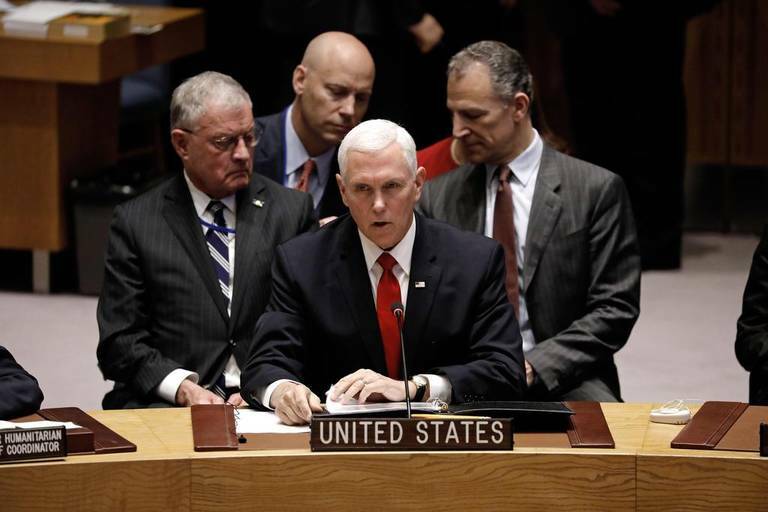 SORRY MR. PENCE AND ADMINISTRATION… This is NOT “OUR NEIGHBORHOOD”, NO NOT YOURS, MY, OR ANYONE ELSE; Venezuela is of the Venezuelan population is their homeland. …for what’s worth, as for me is concern, there is nothing I desire more than true Peace to come to our ENTIRE HOME EARTH; that MANKIND may learn to PLAY, SHARE IN LOVING KINDNESS, RESPECT ONE ANOTHER… RATHER than continue learning about treacherous ways, war, and spending time thinking about how to take my/your brother’s/sister’s belongings = COVETING!